Cost-wise, you're looking at a little over $900 for the two head kit and a bunch of accessories as seen below in the picture. 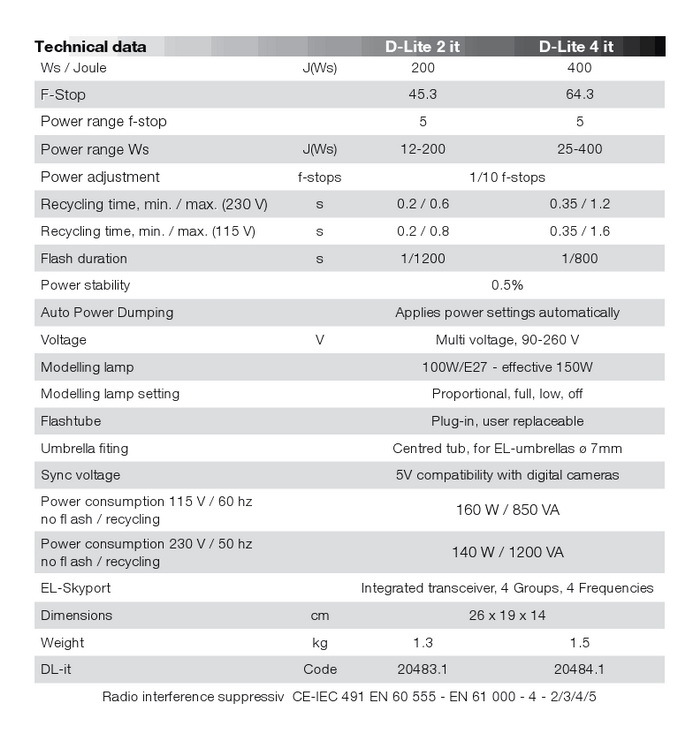 To get the same power from off-camera flashes with all the stuff below it would cost you over $500 for each pro-type flash unit such as the Sony HVL-F60M or equivalent, and then you'd have to buy 9 flashes to get the approximate light power as the two 400ws heads, 9 x $500=$4500!! Then you'd have to buy the lightstands, softboxes or umbrellas, wireless triggers and cases etc to run the cost up even more!! The included skyport and built-in receivers are worth about $200 if you had to buy a wireless trigger system separately. Obviously, camera flashes have their place; they're convenient and work especially well in small spaces, but when you're confronted with large dark spaces, or jobs that require lighting finesse, such as adding grids to better control your light, or large softbox set-ups for wrapping the light around your subject at small apertures, you'll need some powerful strobes. This set-up is AC powered, if you want the freedom to roam without electrical constraints, plan on spending several thousand dollars for a good unit with a battery that will last. Based on past experiences, the batteries are the weak point in the cheap battery pack systems. This two head kit is decent, but plan on buying a new battery or more every year, along with all the accessories. Sometimes buying cheap stuff winds up being more expensive in the long run than good stuff. Important info about this kit: very sensitive slave cells, will detect faint flashes even when placed in adjacent rooms, so no need to use other triggers methods; will learn camera pre-flashes, so you can sync with your camera. The 'it' designation stands for intelligent triggering, meaning it can learn pre-flashes etc. Also, works very well with Radiopoppers triggers right out of the box. Fan cooled, and fan only comes on when firing off a lot of full power bursts. Proportional (or on-off, hi-low) 100w modeling light. My only complaint to date; the lowest power setting is not really low enough if the subject is close to the strobe. Heads and available grids made in India. 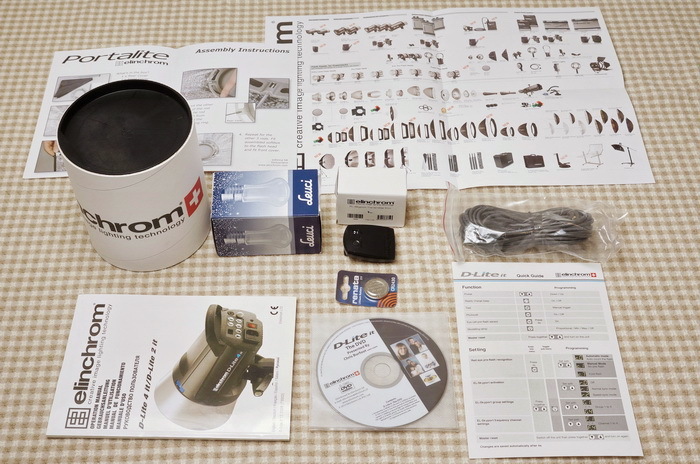 Well, with the introduction out of the way, let's have a look at what you get with the Elinchrom D-Lite 4 it kit. Starting at the top; embossed black zippered case with shoulder strap that holds the two heads; two cords, and one reflector, that's odd they only included one reflector, but I guess they think you're only going to use the set with the included softboxes which do not use reflectors. In the middle are the two Manfrotto 9' light stands (not air cushioned), and a nice padded carrying case. Along the bottom are the mounting rings, rods, white diffusers and black with reflective silver 26" (66cm) softboxes, each with their own carrying case. included smaller items are L-R; softbox set-up sheet: accessories available for purchase: a tube for protecting the modeling lights; I'm only showing one in the blue box, but it comes with two: the small white box and two items below it are the Skyport transmitter and battery: next is a 3.5mm sync cable. On the bottom row is an owner's manual, informative CD, and a quick start guide. Understanding the power of the 400ws head is tricky: a typical top-line off-camera flash has a guide number of 56m at ISO 100, 48°. 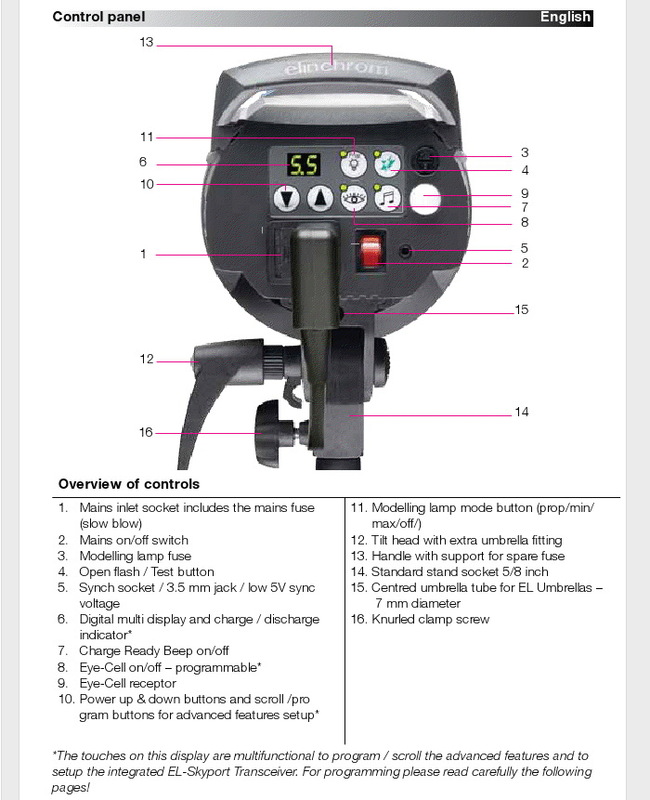 This 400ws head has a guide number of 296m at ISO 100, 48°, that's just over five high power off-camera flashes! However, the effective output on your off-camera flash can alter when zoomed or when using the wide angle diffuser, so it's hard to directly compare. 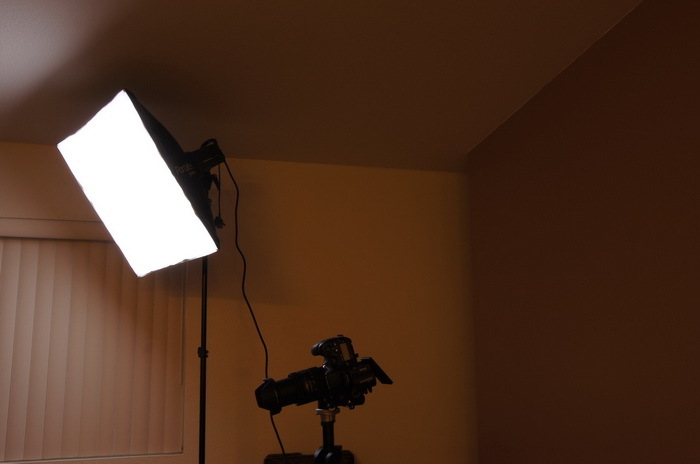 As a result of lengthy and precise testing, I came up with 4.5 off-camera flashes to equal the light output for each 400ws head, or about 9 to equal the two heads, that's a lot of camera flashes, and a lot of money! Top camera flashes are usually rated around 150ws, but that's phony, it's probably at the max zoom setting, actual testing would suggest about 89ws. This is one unit assembled and in working order, although the stand is not fully extended. Note; if you buy just the strobe head, make sure you put it on a good stand that's stable at the maximum extended height, otherwise you may wind up picking up the pieces to your new head and going home; really! 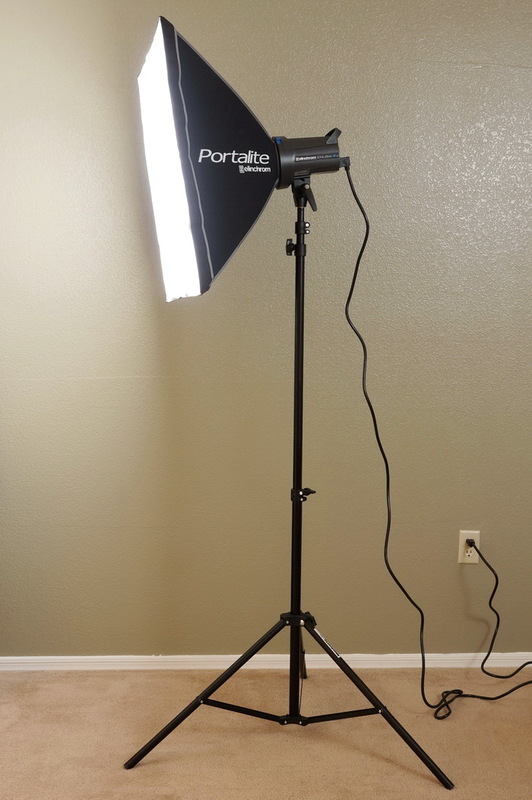 Raising a stand all the way up with a strobe like this attached can be unstable when a cheap stand is used. Fortunately, the included stands in the kit have a little wider stance than the typical stand, and are adequate at the fully extended height when level. Shooting through an umbrella results in a loss of light as part of the light is bounced back. Although this may help soften the light in a small room with white walls, it hurts output in a larger room, or room with dark walls. Shooting through an umbrella makes softer shadows as opposed to turning the umbrella around and bouncing the light back towards the subject. The example above looks like there's a lot of light being lost behind the umbrella, but it's really not that much, maybe a third of a stop. With a softbox, you don't need to worry about light being lost at the sides or behind, it's closed, so all the light is being directed forward. Both images have the same exposure and light output for the comparison. This side-by-side comparison illustrates the power differences between the 400ws strobe, and the off-camera flash. Both are being fired through diffusers at a distance of about 16' (5m) to the chair. On the left is the strobe firing at full power, with the aperture set at F/14 to keep the exposure in check. 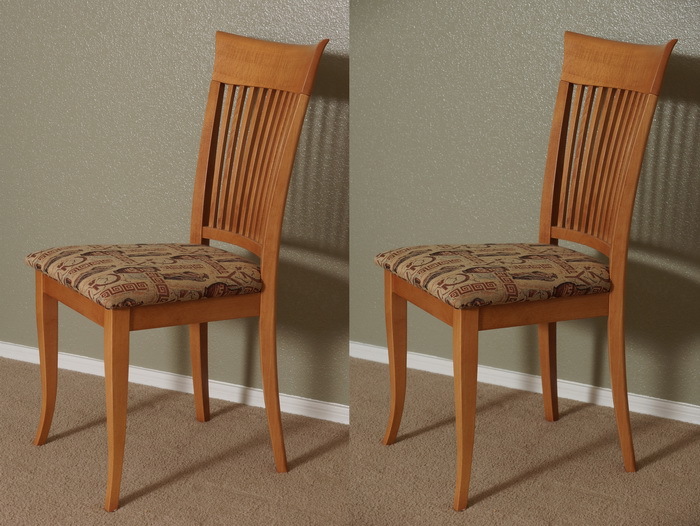 One the right, the camera flash is set to full power, but the aperture is at F/5.6, a difference of 2-2/3 stops. I could've closed the aperture another 1/3 stop to better equalize the exposure; down to F/16, which is three full stops. 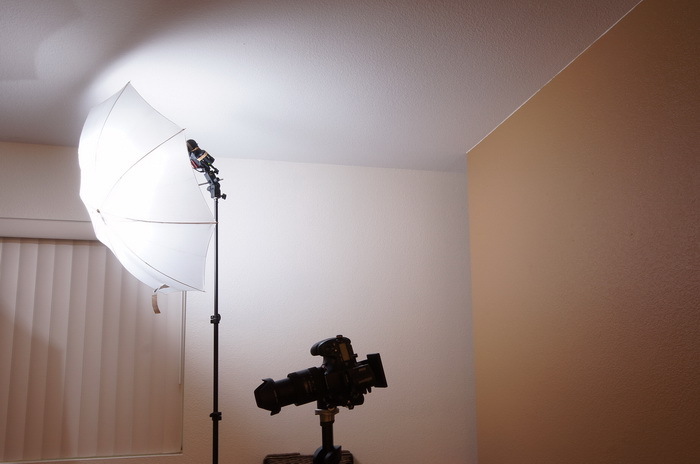 The 26" (66cm) softbox of the Elinchrom is a little smoother than the 33" umbrella, plus I like the strobe color better. Other than the aperture, all camera settings were the same, ISO 200, 1/30sec, WB 5000k. This is an optional grid package, with three grids, 12°, 20° and 30°, along with what they call a mounting ring, but you don't need this, the grids snap in to the reflector. The filter/mount ring may have come with the reflector in the strobe kit, I'm not sure now. You might try the cheap Impact grid set here, and see if it fits the reflector of the Elinchrom, I don't know if it'll fit or not. 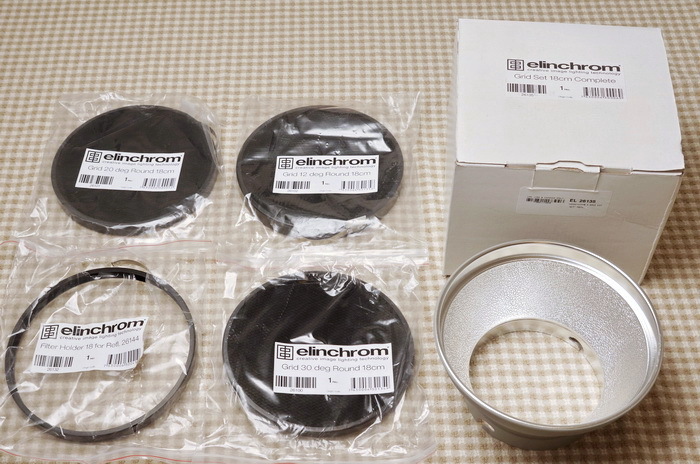 Check the Elinchrom grid reflector out here. 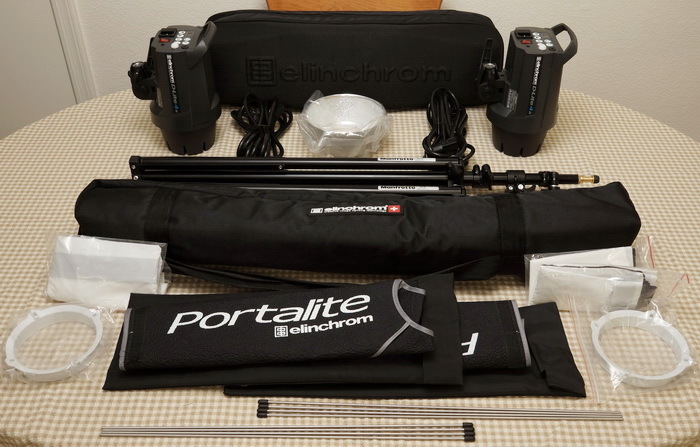 That's it for this review, if you'd like to support the site, check out the Elinchrom D-Lite 4 it kit by using the link, thanks!